Bristol Lunatic Asylum took leisure activities for patients seriously. It was seen as part of supporting the patients to regain their health. They had a small library and organised a number of sports activities including cricket. Each week they had a concert which most of the patients attended. In 1864 bagatelle boards and a skittle alley were provided, billiards was introduced in 1884, croquet in 1892, and bowls in 1896. And there was the annual ball to which visitors including the local press were invited, the quote below being from the Bristol Mercury, February 4th 1871. Brass bands have their roots in the working class, and grew out of the industrial revolution at the turn of the 1800s. Many places of work, where there were enough male employees, would sponsor a brass band. Today in Great Britain there are thousands of bands with many of them having origins prior to 1900. The cast of colourful characters from the newspaper article can mostly be traced in the Asylum case notes held at Bristol Archives. Lingard’s profession is listed as comedian, (Admission book BRO40513/C/2/3,116) but Tustin was not listed as an inventor but a tailor, (Admission book BRO40513/C/2/4,73). 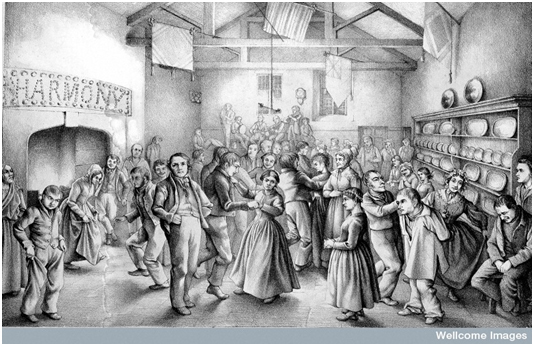 In the two illustrations of Asylum balls below, the participants do appear for the most part to be enjoying themselves. 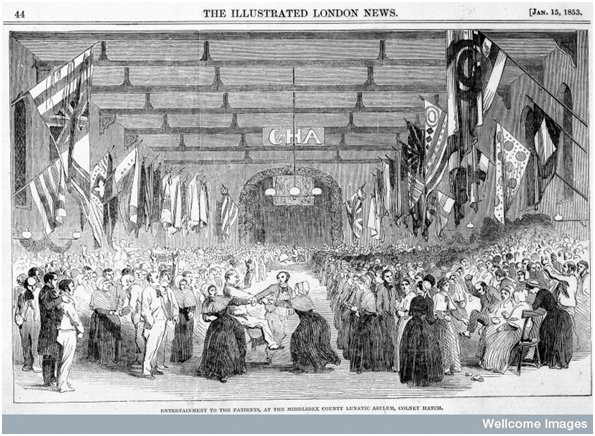 One illustration shows a ball at a Somerset Asylum and is a fairly small affair. The other illustration is of Colney Hatch, which was a very large asylum, and shows a large crowd of people.